One aspect of South Africa we had found a bit bewildering was the difficulty of plucking ourselves out of the tourist economy and putting ourselves into the local economy. So on our trip to the wine-producing regions east of Cape Town we decided to not let the high-gloss brochures and promise of a safe, trouble-free excursion tempt us. We were going to “do” wine country–which to us just meant taking a pleasant trip into the countryside–without any outside help. Our plan was to take the Metrorail train to Stellenbosch. Although the guidebook suggests a $20 each-way ride in the tourist coach as the easy, mainstream way of accomplishing this trip, we felt the $2 train fare was worth whatever hardship we would have to endure. 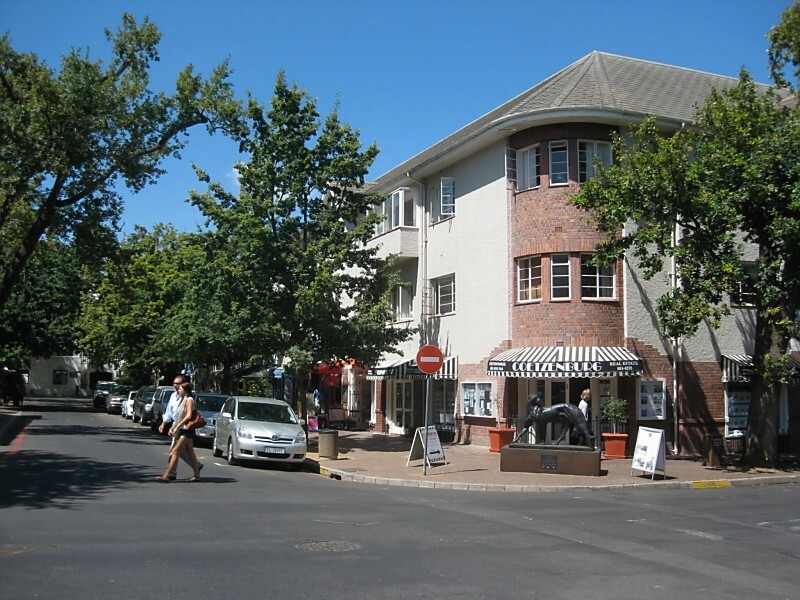 Stellenbosch is a pleasant, medium-sized city, with lots of Dutch Colonial architecture. The center has an old church, armory, and some nice streets, lined with cafes geared towards wealthy South Africans and foreign tourists. But it wasn’t exactly what we wanted. 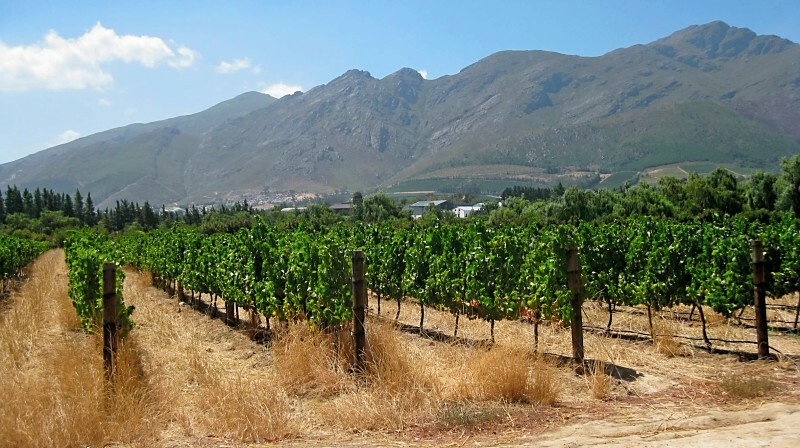 The people at the tourism office stated that there was no vineyard within walking distance, and the only option was to take a R170 ($25) tour bus that stops at four separate wineries. So we found another way. 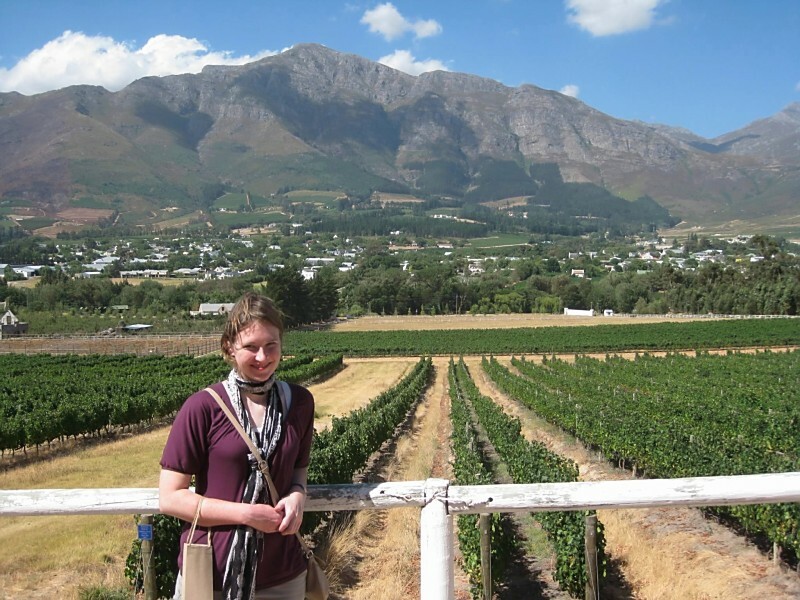 We had read about a town called Franschhoek, which, while touristy and expensive, had wineries within walking distance and was set in a beautiful valley. Although the guidebook says it’s not worth really attempting unless you had your own car, it was apparently possible to reach the city by minibus (or “minibus taxis”, as they’re called here). Sounds fine to us! We headed to the bus station and began asking around. Although none of the signs said Franschhoek or anything close, we hopped on the bus indicated by the locals to be the correct one. The bus went straight away into the higher, more rugged country before turning off into a medium-sized village, where we spent a good twenty minutes dropping off and picking up passengers, then continued on to a smaller town with little more than an elementary school and a grocer. The bus driver said, “Get out. Wait here for another taxi.” And he was gone. The next taxi came surprisingly fast–I had to run from the grocery store, where I was buying a Coke (“Oh, you aren’t a South African? !” when they heard me speak), then stand up the whole first part of the minibus ride. Ultimately, we were dropped at an intersection with a signpost pointing towards Franschhoek and told to wait for a bus headed in that direction. It wouldn’t be long now. After about ten minutes on the new bus, we turned and started driving through a township area on the outskirts of Franschhoek. After winding through the rough streets of the township for a while, we finally found ourselves dropped at the end of the line, just outside the tourist zone in Franschhoek. The mountains in Franschhoek were incredible. Both slopes of the valley were lined with vineyards, which eventually gave way to rugged, rocky mountains. 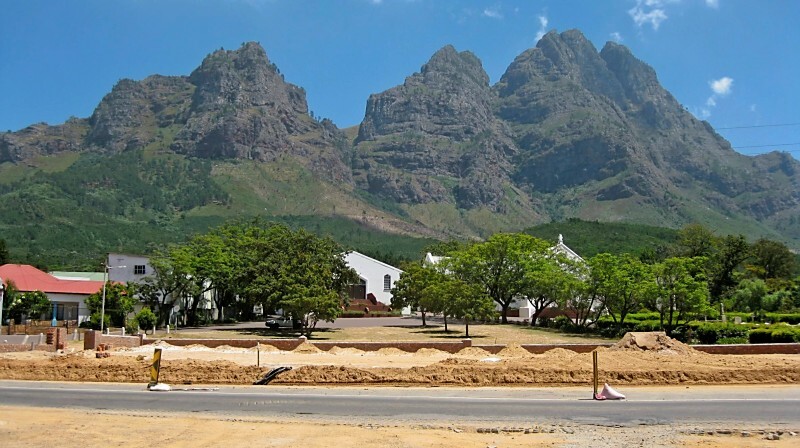 The region was much more compact than Stellenbosch–you could probably walk across the valley in half an hour–and the mountains were higher and closer. 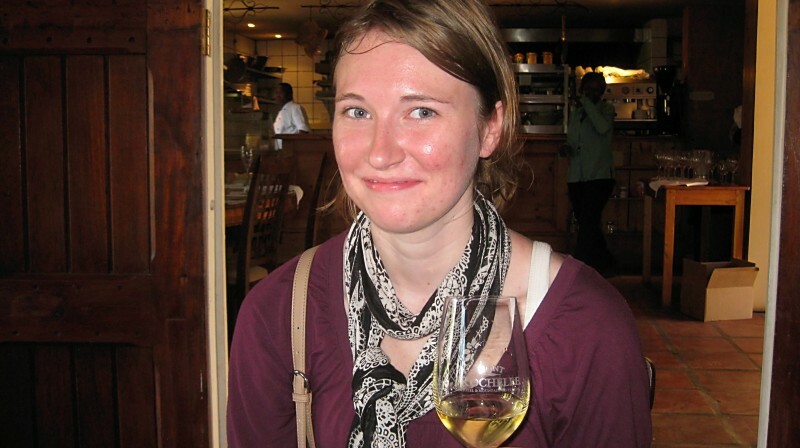 The area was originally settled by French immigrants, who promptly began producing wine in the valley. Everything was also very expensive and exclusive. We felt like intruders into a hidden world. 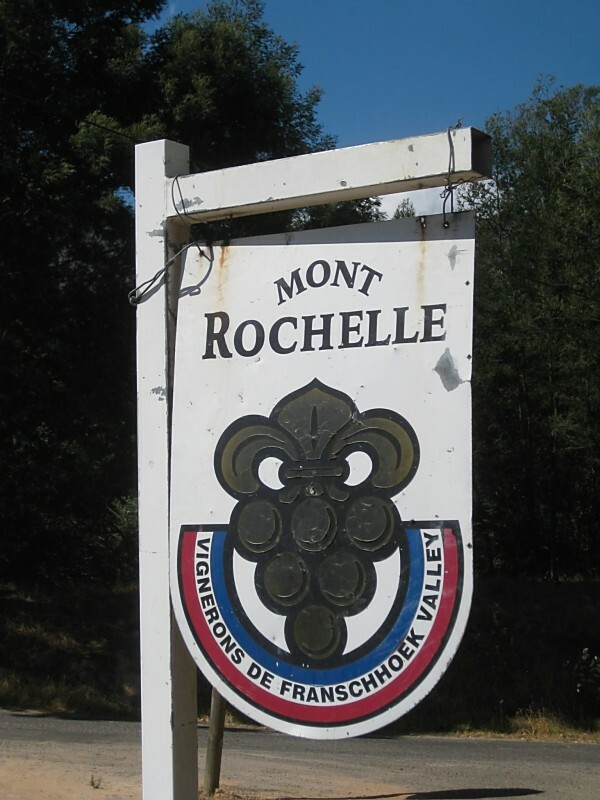 We decided to head to one of the closest wineries, called Mont Rochelle. There we did a wine tasting for R20, and got to tour the lovely grounds of the vineyard, which had great views. Because it had taken most of the day to get out there, we decided to take an easier minibus ride to Paarl, on a different train route. After explaining the predicament we faced surrounding our train tickets (which did not include a trip to Paarl), the confused Metrorail employees just shrugged and let us through. We accidentally sat in second class on the train, which turned out to be a great mistake because we were able to witness the incredible talent of a Congolese salesman who had was a master of punning in at least 5 languages, and had the whole cabin laughing along as he made his jokes. He was so good a salesman I actually bought something. It’s incredible to think of just how talented an entertainer he is, and how his talents are being spent selling candy in the second class compartments of the Cape Town Metrorail. All in all we made out exceptionally well. We had a great day only spending about R70 ($10) on transport per person, and a couple dollars more on the wine tour…Not bad! 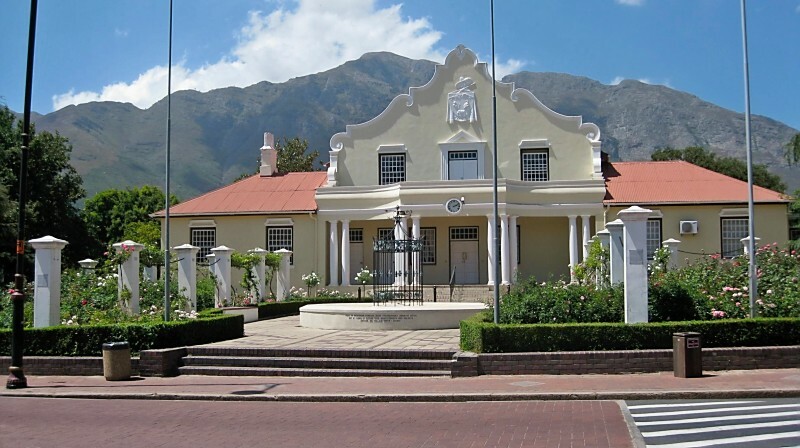 Travel Info: If you’re keen on getting to Franschhoek from Cape Town using public transport, the best way to get there is to take the Metrorail to Paarl, rather than going via Stellenbosch. 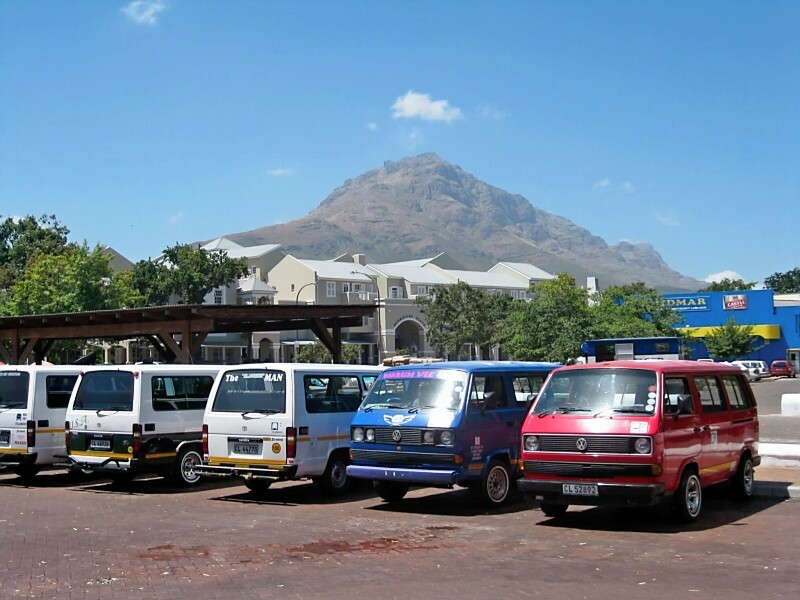 On the road outside the train station, minibus taxis run between Paarl and Franschhoek regularly–ask around. You are such the troopers! I’m thrilled that you see a ride with the locals as an adventure. I love you both!